This world-famous festival celebrates the heart and soul of gravity-fuelled mountain biking. The best riders and biggest bike fans in the world come out for a week of racing, slopestyle competitions, Kidsworx, bike demos and the chance to shred Whistler’s trails with other like-minded bike fans. The following information is from the 2018 event – we'll have the Crankworx Whistler 2019 info here when it is released! Every day of the festival is packed with events, races and demonstrations, many of them free to watch. Learn about the events and view the spectator schedule below to see the highlights for each day. Visit the Crankworx website for registration and athlete information. Scroll down and select to find out more about each exciting event. A series of events designed for the next generation of cyclists, with mini-challenges, races and skills sessions available through the week. All levels of rider are provided for with events including Skill Zones, a Village Crit, Run Bike Races, Scavenger Hunts as well as enduro races, DH races and pump track challenges just for kids. The Expo at Crankworx Whistler gives the biggest names in mountain biking and our sponsors a chance to showcase their stuff. Whistler Village comes alive with the vibrant tents and interactive displays of all the industry heavyweights. For all the latest information on products and services, you've gotta check out our Expo! The Demo zone is in Lot 2 Across from Pan Pacific Villageside Hotel. The most respected brands in the industry will be in the demo zone with their newest Trail, DH and Freeride bikes for you to try for free. On your way check out the Tech Zone is in Lot 2 Across from Pan Pacific Villageside Hotel from 10am–5pm daily. The beating heart of professional mountain biking, where bike savants wrench on prototype bikes, interacting with riders as they chill at their team trailers between training runs and races. An invitational field of the best Dual Slalom racers will go head-to-head against slopestyle's superstars, racing through side-by-side tricked-out Dual Tracks. The fastest down the course wins the speed points, but while speed ultimately decides the victor, it by no means trumps style. Racers earn a time credit for points accrued via mid-race Supermans, backflips and spins. Riding clean and fast on showcase trails with friends and legends is the order of the day in Enduro racing. The trails selected for this multi-stage race will reward the generalist over the specialist, while showcasing the best of Whistler rooty, coastal rainforest trails and challenging scree steeps of the Whistler Mountain Bike Park. This race is Round 7 of the 2017 World Enduro Series. The Liv Women's Only A-Line Session is the perfect way to start the day off right with some dirt-loving logging A-Line laps. Whistler Bike Park coaches will also be available to guide you down the trails during this women's-only session. Expert tips, tricks and guidance will help participants make their descent with confidence and take their skills to the next level. A vertical marathon, the Garbanzo DH is a gruel-fest, a magnet for masochists, a 3400-foot top-to-bottom toll-taking test of mountain biking supremacy. The unrelenting seven-kilometre descent requires sustained intensity as riders match stamina with smoothness and strategy to stay on their game for one long, lonely ride through three bioclimatic zones, with only pain and the mountain's mood swings to accompany them. A killer link-up, the Garbanzo DH course snakes through some of the most aggressive terrain the Whistler Mountain Bike Park has, making it a leg-busting, stand-up-and-pedal tour de force. The Dirt Diaries puts creative power into the hands of photo and film-focused mountain bikers, tasking them to capture the essence of the experience we all share and love. Riders assemble a team of up to six people, including film crew, editors and other athletes, and are given two months to put together five minute videos to tell their own unique story. Submissions are judged based on storyline, videography, riding and editing, then screened in front of a massive audience under open skies at the Whistler Olympic Plaza. For over a decade the Fox Air Downhill has been the heart of Crankworx Whistler. Racers sprint down A-Line - Whistler's most iconic bike park trail - scrubbing bumps and airing 1200 vertical feet of jumps on the way. You'll see speed and style on this epic race. Skill and style reign supreme in this event that brings together the best racers and freeriders in the biz. The Whip Off World Championships combines big attitude with big whips, as riders duke it out to win the admiration of the crowd, the respect of their peers and, ultimately, the title of king of killer whips. Welcome to the dirt laboratory, where riders are pitted against one another, tasked to master a maze chock-full of berms, doubles and gaps without making a single pedal stroke. Riders duel back-to-back in this stripped-down skill showcase that's a true test of a rider's ability to master horizontal momentum. Rivalry at its most naked, the Giant® Dual Slalom's crowd-pleasing format pits two competitors, side by side, racing against the clock with one rider eliminated per round. A bike-handling battleground, the finely sculpted track of jumps, berms, rhythm sections and drops pits 4x specialists against gnar-chasing downhillers. Riders take one run down each side of the course. The fastest combined time wins. Each lap through the track raises the stakes and works up everyone's appetite to win. Fusing elements of slopestyle, dirt jump and North Shore-style mountain biking, slopestyle at Crankworx Whistler brings full-on, gravity-fed, season-defining freeride mountain biking to Crankworx. The Red Bull Joyride at Crankworx Whistler is the final event of the internationally-reknowned Crankworx Slopestyle World Tour and marks the climax of 10 days of mountain bike revelry in Whistler. Only the best riders in the world compete in the invitation-only event, interpreting a custom-built course melding natural terrain with impressive manmade features. By far the biggest event on the calendar, thousands-strong crowds will cheer the riders as they bring their Agame to the slopes. The Canadian open DH course is a a one-run takedown of Whistlers famous terrain, on a trail sporting rooty single-track, steep rock drops and big air features. This notoriously rough course demands nothing less than laser focus and blazing guns, and each year continues to solidify its place in the mountain biking world as a premier downhill course of gnarly character and raucous renown. Parking can be a challenge on the weekends, take advantage of car-free transport options and enjoy free transit on weekends. Parking in Day Lot 2 is unavailable during Crankworx Whistler. Additional information on parking can be found here. With plenty of bike enthusiasts in town for the festival, expect a higher volume of peoeple on the trails, more people looking for services and parts and a lower availability of rental bikes. Book your accommodation, bike rentals and make restaurant reservations well in advance for a smooth festival. 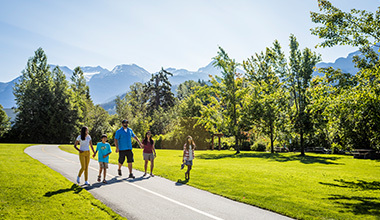 Note that due to events in the Whistler Bike Park, trail closures will be in effect. Check out the official Crankworx website for trail closures, or check in with Whistler Blackcomb Guest Servies on the day. They came, they shredded, they left dusty but stoked. Check out our Crankworx 2017 highlights and start planning your 2018 trip. Like to pedal, huck, jump, pump, enduro or flow? Whistler's got trails for miles and a bike culture that will blow your mind.